In a tradition of political satire that ranges from A MODEST PROPOSAL to DR. STRANGELOVE falls the perplexing, ingenious, and ceaselessly curious REPORT FROM IRON MOUNTAIN. Upon its first appearance in 1967, this best-selling "secret government report" sparked immediate debate among journalists and scholars with its disturbingly convincing claim: a condition of "permanent peace" at the end of the Cold War would threaten our nation's economic and social stability. Although finally identified as an antimilitarist hoax by writer/editor Leonard Lewin, who conceived and launched the book with a consortium of peace movement intellectuals including future NATION editors Victor Navasky and Richard Lingerman, novelist E.L. Doctorow, and economist John Kenneth Galbraith, IRON MOUNTAIN would eventually take on a life of its own. 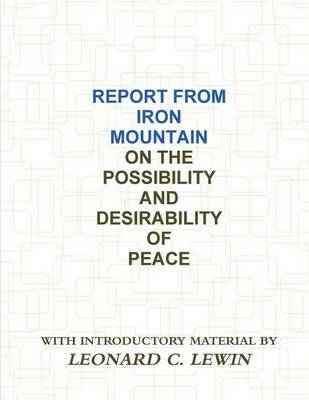 Buy Report From Iron Mountain by Leonard C. Lewin from Australia's Online Independent Bookstore, Boomerang Books.